On the heels of announcing a massive North American tour, The Mountain Goats have announced a nerdy-as-hell new album, In League With Dragons. In line with the album’s D&D-esque themes, the band will live-stream a concert from the headquarters of Wizards Of The Coast, the publisher of Dungeons And Dragons, at 3 p.m. CST on Monday, where they’ll perform some new music and share more details about the album. Here’s what we know right now: In League With Dragons lands on April 26 via Merge Records, and is said to “luxuriate in a wide swath of sounds, from shades of the ‘80s Athens scene to swathes of outlaw country and a few motorik meditations.” Songwriter John Darnielle recorded it in Nashville with bandmates Peter Hughes, Jon Wurster, and Matt Douglas, as well as engineer Matt Ross-Spang, whose resume includes work with country stars like Jason Isbell, Margo Price, and John Prine. As such, expect it to veer away the piano-driven melancholy of 2017's Goths. There’s also a song called “Clemency for the Wizard King,” which we can’t believe wasn’t already a Mountain Goats song. 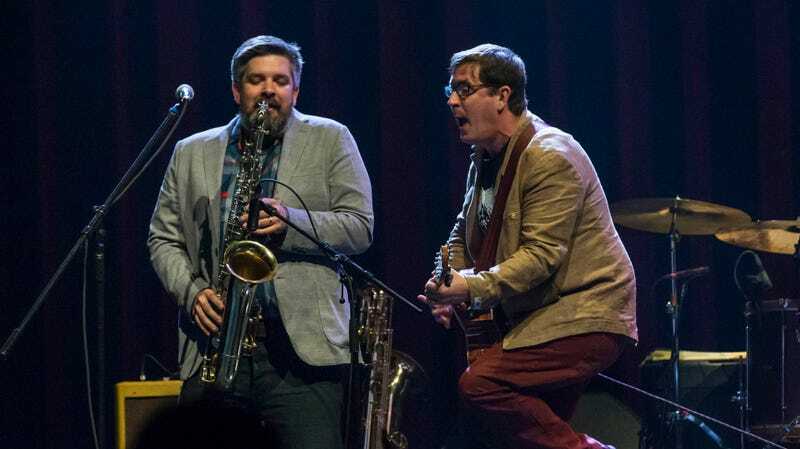 In a statement, songwriter John Darnielle reveals that the album began as a rock opera, but took on a new shape after he started binging some mystery novels. Read it below. You can also hear the album’s lead single right now. Called “Younger,” it’s a six-minute stomper that paints a vivid portrait of Darnielle’s fantasy world. The livestream can be accessed via the Mountain Goats, Dungeons And Dragons, and Magic: The Gathering Facebook groups. You can also stream it via the D&D and Magic Twitch channels.